As we are leaving the winter Olympics behind us, I stumbled across yet another film at the Internet Archive with a winter Olympics connection. Actually, I have seen it years ago, but forgot all about Barbara Wilson playing an American Olympic figure skater who is training in the Swedish part of Lapland. The film in question is Terror in the Midnight Sun, known in Sweden as Rymdinvasion i Lappland. I have been trying to find some good background to this movie. Such as, who came up with the corny idea to make a Swedish horror B-movie in the first place? And how was anyone convinced to invest money in the production? Alas, no such info has emerged. 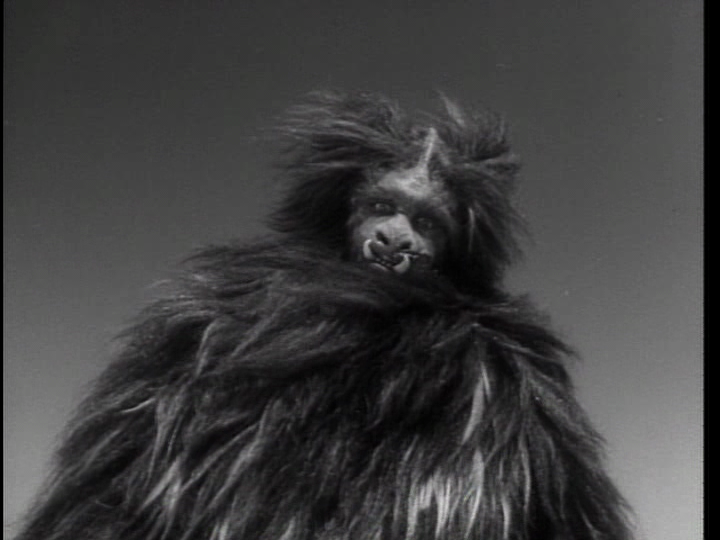 In America, it seems, this film is best known as Invasion of the Animal People, after Jeremy Warren butchered the original and added scenes and narration by John Carradine. The version at the Internet Archive, however, is not that. This is the original and much superior film. Oddly, it seems that this original was never distributed in America, even though it was a joint Swedish-American production. 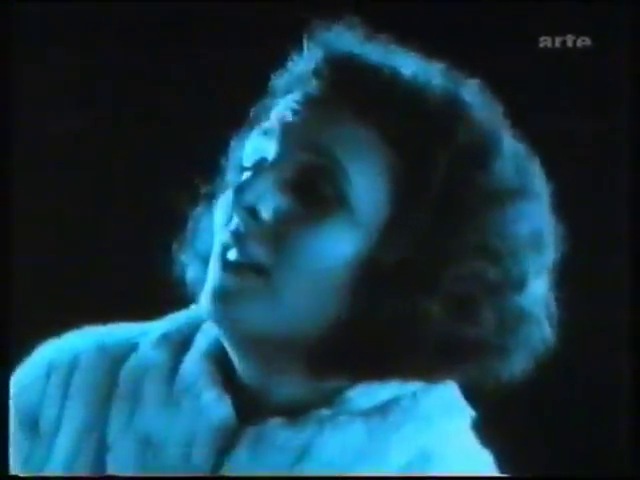 Barbara Wilson gets ample opportunity to practice her screaming and fainting routine, as she does the standard female victim role with some bravado and less talent. She does provide some more interesting performance early in the movie, though. There are some genuinely good aspects of this movie, such as the many mood-setting on-location shots from Stockholm and northern Sweden. There are also some well-made scale models that the man in the monster suit gets to wreck, and most of the dialogue makes sense (and I imagine native English-speakers find the genuine Swedish accents half amusing, half exotic). The music is good, too, especially during the closing credits. 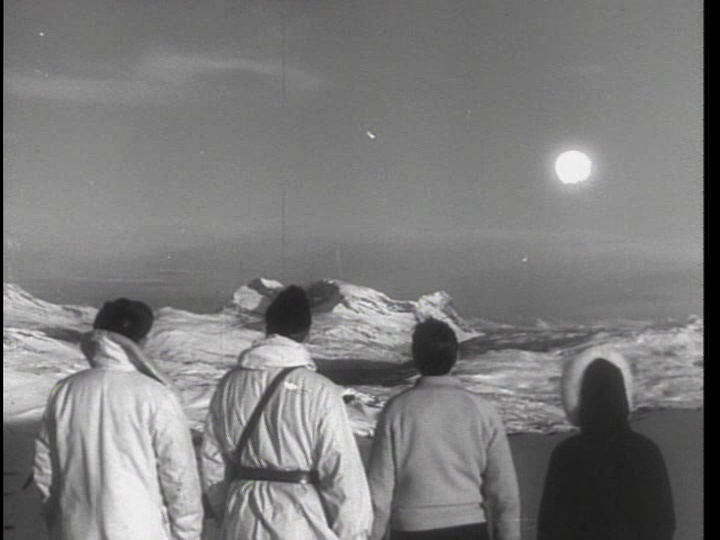 But, of course, you do not watch Terror in the Midnight Sun for its qualitative moments, though they help to make the experience worthwhile. This film is best enjoyed for the Swedish connection, the corny plot, the aliens looking like government officials in bathrobes and the laughable, low-budget special effects. And speaking of special effects, the white blot in the screen shot below is not the midnight sun; it is the alien ship. The ongoing Winter Olympics have put a bright spotlight on Russia, and the revealing light has not been kind to the hosting country. Much of the headlines, except for those that purely deal with the athletic events, have been about corruption and abuse of power. This is not exactly something new in Russia and the Soviet Union, of course. Present-day leaders merely follow a tradition that goes back hundreds of years. Yet, in spite of oppression and flawed leadership, Soviet and Russian film has been among the best in the world for at least a hundred years. 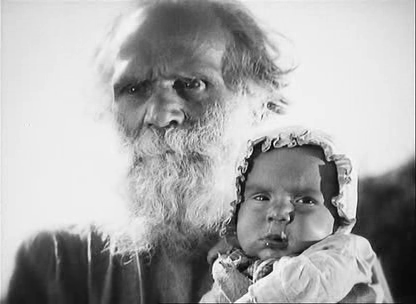 One of the most important of the early Soviet directors was Sergei Eisenstein. 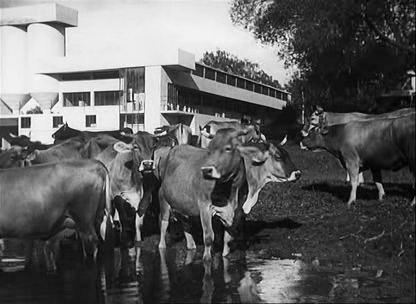 Eisenstein made relatively few movies, but almost all of them are exceptional works of art. Many are available from the Internet Archive and a very good example of his production is Staroye i novoye (Старое и новое), usually titled The General Line in English. Though it is perhaps not his best effort, it is nevertheless well worth watching. It is ironic, really, how Eisenstein’s films (those I have seen) are all very much about humans, yet the characters in them are often anonymous; they have few lines of dialogue; there is very little emphasis on relations with people around them; and they show little development. Yet we feel sympathetic or antipathetic towards them, and Eiesenstein pulls this off with his amazing way with images. Eisenstein’s images are often brutally honest. He was a master of angles and a master of cutting. The tempo is slow, and he let every cut really sink into the viewer’s consciousness before cutting to the next one. He often used closeups to reinforce his messages, for instance the poverty of the under-educated masses before the blessings of communism had penetrated all layers of society. He also used visual metaphors in a way that few directors have the courage to do today. Eisenstein’s plot is simple and, quite frankly, a bit naïve. The political propaganda is very obvious, but there are apparent humanistic values as well. Messages about the importance of sharing and cooperating are just as relevant today, whereas the suggestion that the forming of a cooperative to purchase a milk separator will erase poverty seems a bit simplistic, to say the least. If you have never seen an Eisenstein film before, it is perhaps better to start with his most famous production, Bronenosets Potemkin (Броненосец Потёмкин, known in English as Battleship Potemkin). But if you have already seen that and are still curious for more, then Staroye i novoye is an excellent next film. This film is best enjoyed for its fascinating images. Never mind the story, and never mind today’s or yesterday’s political realities. This is beautiful cinematic art at its best. As an added bonus, you will see state-of-the-art agricultural high-tech from the year 1929. With the Winter Olympics in full swing, I wanted to try and find a film with a winter sports connection for this week’s post. That was harder than I had thought, but luck was on my side and the only feature-length film I found on that theme turned out to be really interesting. Der heilige Berg (The Holy Mountain) is a German silent which is often mentioned as Leni Riefenstahl’s first film (as an actress). But Riefenstahl, quite frankly, was far better a director than an actress, and the film is interesting today mainly for other reasons. The film is built around a very simple (and quite frankly somewhat far-fetched) plot about a love triangle where two friends, initially without realizing so, compete for the same woman (played by Riefenstahl). About the only strong part of the plot is the ending, which is moving (though a bit pathetic). But Der heilige Berg is not much about love and friendship anyway, nor about any specific characters. 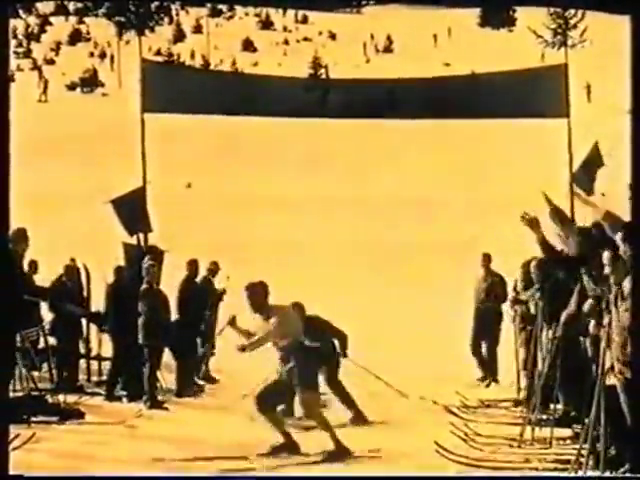 One section in the film shows a competition in Nordic combined, an interesting sport where ski jumping is combined with a cross-country ski race. The scenes from the competition are lengthy, but the interest is kept up all the way due to the excellent filming and the great variety of the scenes. It is also amazing to see what could be achieved even with the relatively primitive equipment they had available. Der heilige Berg was made during the height of German Expressionism, and though it is sometimes cited as part of that movement, it is really much more strongly rooted in romanticism. There are touches of expressionism, such as in the exploration of the darkness of the human pshyche, but not at all as much in focus as in for example Sunrise: A Song of Two Humans (1927). This film is best enjoyed for its beautiful images and for its documentation of winter sports in the 1920s. Russian officials will be glad to know that it is free from any dangerous suggestions of homosexuality and thus perfectly safe to watch. A friend of mine remarked the other day that I practically only write about films that she has never heard of before. I think it was meant in a positive way, but I suppose all the obscure titles may turn others off. The main purpose of this blog is to make people aware of the good stuff available at the Internet Archive, and also to make such good stuff easier to find. Since the classics available from the IA are frequently listed on other blogs, I guess I have subconsciously avoided them in favour of less known (yet often equally interesting) alternatives. Ah, but I ramble. Let me see if I can somehow get back on track. Yesterday, it was exactly 100 years ago that Charlie Chaplin debuted in his first film role, Making a Living. It is not a bad film for a first, but Chaplin’s greatest achievements still lay some years into the future. The Gold Rush, for instance. An absolutely marvellous film from the heyday of the silent cinema, The Gold Rush often appears on lists of the best films ever made. By the time of its production, Chaplin had developed his sense of timing to near perfection. He had also learned the difficult task of good storytelling, although his method was unusual in that there was no real script, only a skeletal storyline from which each scene was improvised and gradually refined. Much has been written about the production of this film, and here I will only touch briefly upon two of my favourite scenes. 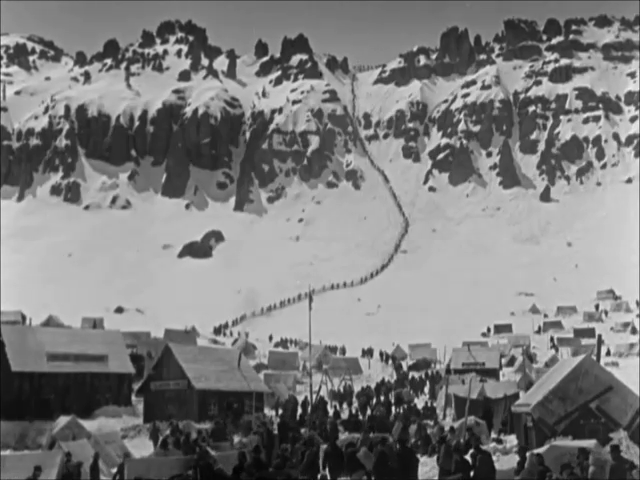 The first is just at the beginning, when hundreds of extras make their laborious ways up the Chilkoot pass. One of the most magnificent scenes in the history of silent cinema. 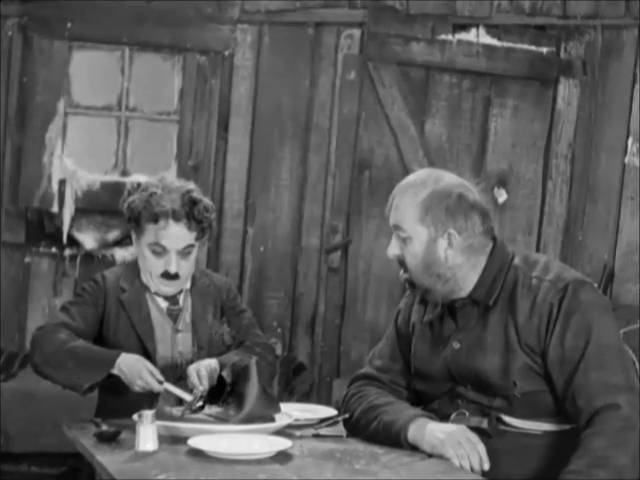 The other is when Chaplin and his companion, both near starvation, share one of Chaplin’s shoes for their dinner. Apparently, the shoe used for filming was made of liquorice and caused Chaplin a bad case of diarrhoea. As is the case with many famous silents, The Gold Rush has been released with a large number of different scores, including one that Chaplin composed for the rerelease of the film in the 1940s. I remember when I first watched the film myself (probably in the mid eighties), and the score was just random classical music. I found it so disturbing I had to turn it off. The experience will be similar with the version I mainly link to from this post, since it contains no score at all. The image quality, however, is very good. On the other hand, there is another version with inferior image quality (though still acceptable) and Portuguese subtitles, but an excellent piano score. You will have to decide which one you prefer. This film is best enjoyed as an introduction to silent film. If you have never seen a silent before, this is the perfect place to start.